Often when we design our homes, we tend to spend a lot of time thinking about the ways in which our house could truly create a pleasant and awe-inspiring impression. People spend huge bucks just to get the perfect decor, but what is oft neglected by people is that the doors of the house need not be mundane and monotonous. A door could also be spiced up to create something much more modernised than the rest and much more in line with the rest of the decor of the house. 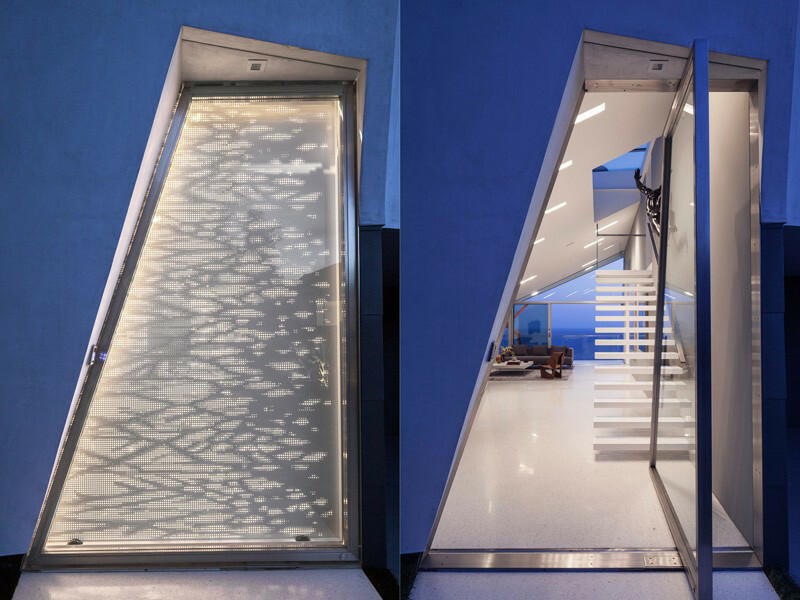 So, today we are going to elucidate this idea for everybody out there, id est, how to get the perfect creative door for your house. And by that, we mean a pivot door. Let's first address the immediate query that might have erupted in many of our readers: what exactly is a pivot door? 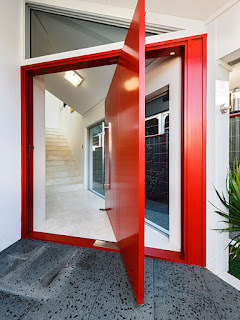 Now that we have established the basic definition and uses of a pivot door, it is now time for us to list down ten such incredible doors from around the world, in reality and in ideas, that we absolutely love. 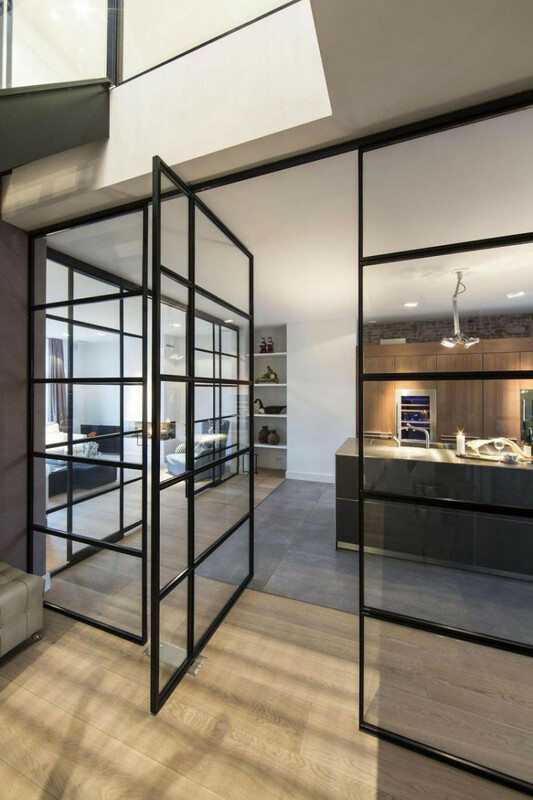 This pivot door in New Zealand is the perfect way to kick off this list, as it clearly shows the elegance that is associated with a pivot door and the beauty of it. 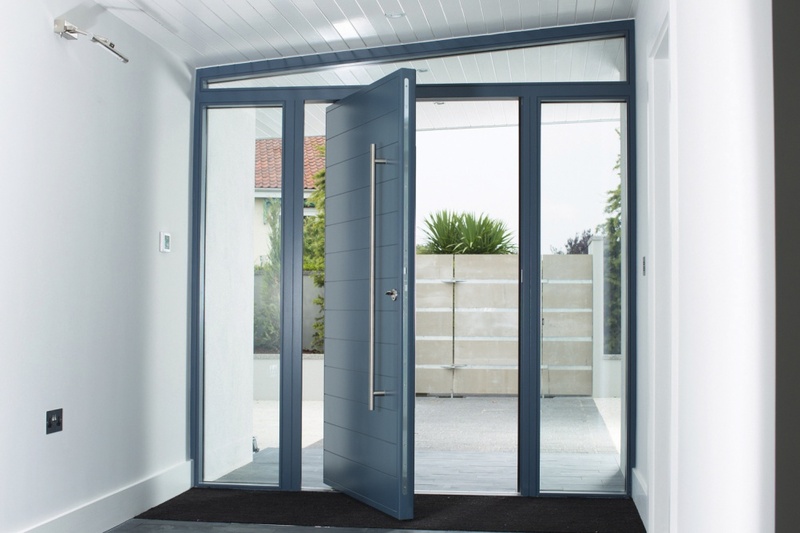 This particular pivot door is made of timber and has been installed at the entrance, to give the place a more modernised look. And the place does look modernised. The embodiment of a classic pivot door, the entrance is just a single door that encompasses the space of two (or probably a door and a half? ), and not only does it become a fun entrance, it also gives the place a much more voguish nimbus. It's now time to kick things up a notch; and we begin with Greece. The Greek architecture has a finesse of its own and this door exemplifies that. 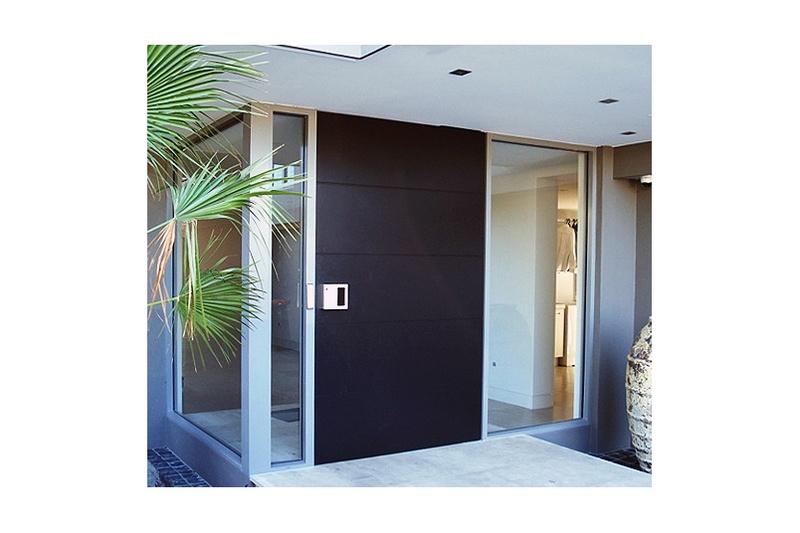 The beauty of this pivoting door comes from its wooden exterior and the wooden frame above it. Further, the contemporary design beside the door (that criss-cross thing) makes the entire appearance even more modernised. Modern art is a work from within, and this work is the perfect example for it, The design is a designer's internal idea and has been implemented well. And we admire the door for this justification. Well it's not always you see a door like this! Just imagine walking into a house and then beholding this glass door in front of you. Wouldn't that be amazing? The firm, dark pattern contrasts well with the glass door, and the real creativity here lies in the introduction of a large glass panel, in which the pivot door is installed. So the bigger picture really just is one big glass wall, but at the centre of it is a door. Well isn't that cheeky? And we guess you'd agree with us when we say, the door does add a certain sense of elegance and suaveness to the entire decor. Okay, so this is a design for a pivot door by the esteemed company, Urban Front, who, by the way, are the sole producers of pivot doors in the United Kingdom; and boy, do they know their doors! The door is simply a piece of perfection. 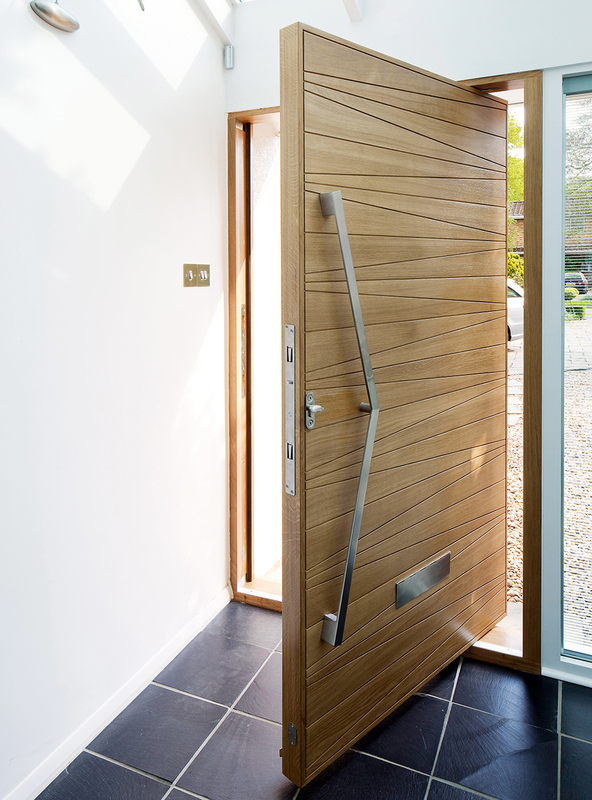 The soft, wooden look goes well with the quirky door handle, which accentuates the door's modernised appeal. 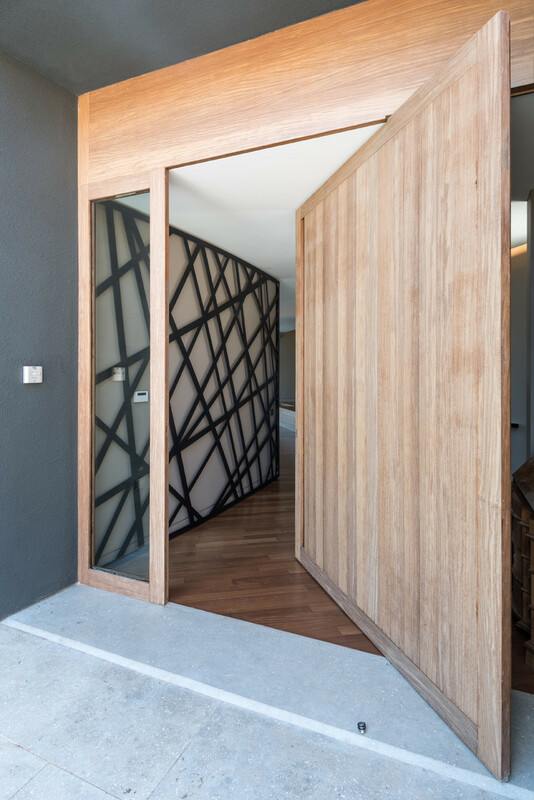 The door is installed at the entrance of the house and has been fortified with a monochromatic tile flooring and a soft tone for the interior. The result of such a bunch of combinations is that the interior looks sunnier and warmer, which obviously concords well with the contemporary look of the house. Whenever we hear the word "London", we start imagining the hues of grey and white, (along with red, blue and white, of course), but London is famous for its elegant incorporation of these tricky shades and this door is a classic example of it. The large pivot door is a nice blend of the colour grey with the soft white, and the glass walls present the room with a mix of sunny-side and the cold breeze of winters. So basically, London. The door lends a contemporary look to the entire interior because of the elements we just named and because of the large handle it has that supports the size of the door. Really, this is a bona fide epitome of what a large pivot door should be like. This door is a beauty. The rich, monochromatic shade of the brown, along with the subtle door handle and the elegant, black channel beside it; all contribute together to make the door a success. The smooth polish of the door, and minimalist design of the interior, complement each other well, as they provide the place with fine finish, As soon as you eye this door, you are bound to be mesmerised by its smoothness and neat finish. 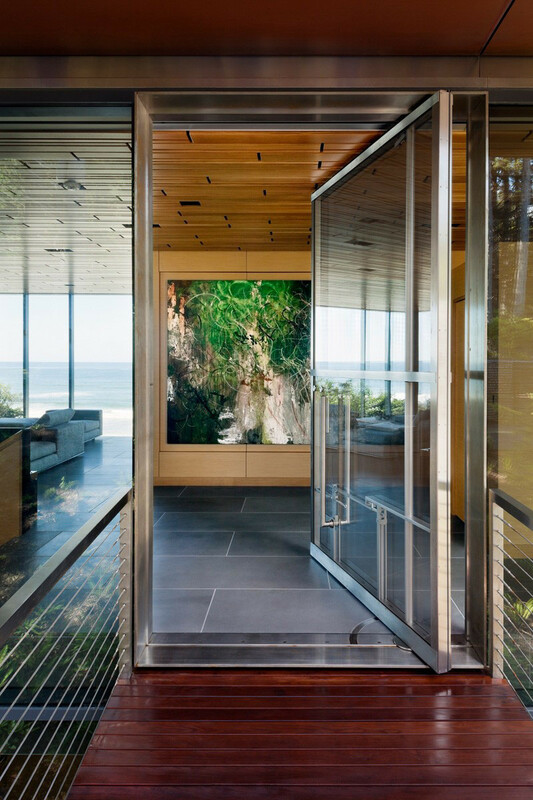 This pivot door from Oregon Coast is a trendy and innovative one. 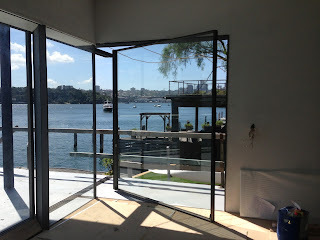 The door is fitted with glass and is relatively smaller in size than the ones we have viewed till now (but it's still quite large); and is supported with a wooden framework and a modernised flooring. The contemporary shades and the interesting combination of colours, underscore the glass element of the door, which makes it irresistible. And extremely pleasant to the eyes. We certainly love this idea and suggest it to anyone who loves to go creative. 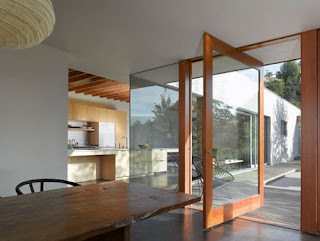 This is a beautiful example for a large, pivoting door. As is evident from the photograph, the door underlines the elegance of the room because of its simple design: it uses just glass. The entirety of this door is made of glass and what's even more beautiful is that the framework of the door is sleek and neatly done, so the overall effect does not look gaudy; it rather appears quite pleasant. The position of this door lets more sunlight enter the room which will certainly make the room appear larger than it really is. This door looks like a figment of Lewis Carroll's imagination, doesn't it? The contorted shape, the bright red colour and the equally abstract channel; all make it one of the most unconventional doors have ever seen. And let's admit it, we love it. 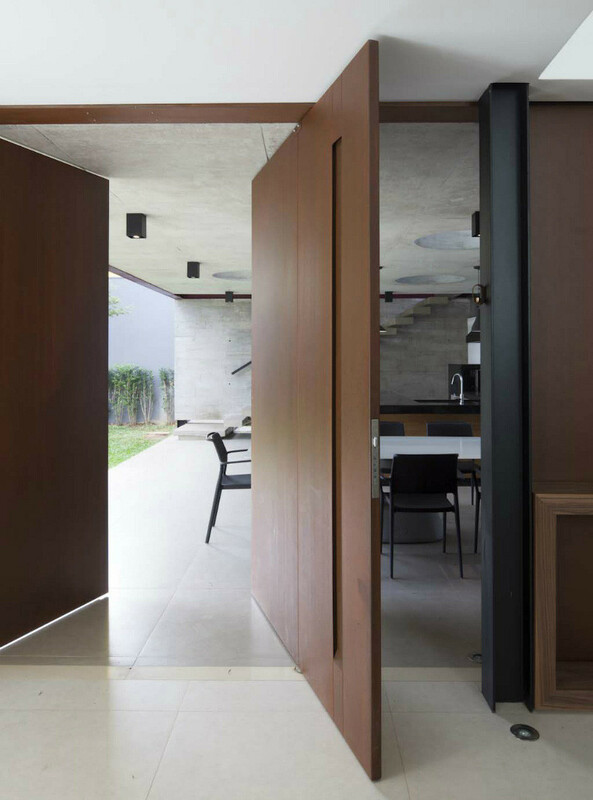 The door lends a contemporary and bold aura to the house. The door perfectly depicts your artistic and creative side; delineates that you are not afraid to try something new and does so in one of the most fashionable manners ever. Yes, we love this door for all its bold elements and the modernised look it provides. 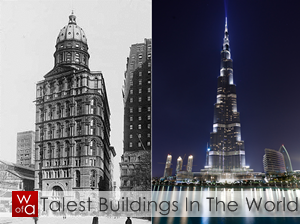 To end this list, we found a door that is quirkier than any door on the list. This beautiful piece of work from California is notable for fortifying an already trendy decor. As is quite readily noticeable, the framework itself is voguish and quite hip (you know what we mean); the large pivoting door only increases that effect, as the custom made door complements the design well. 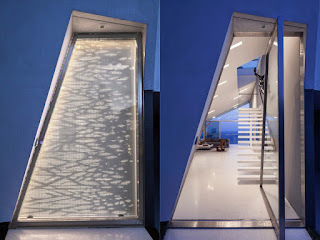 Further, the trendy work/texture on the glass door makes it even more appealing. The door certainly does stand out from the crowd. Well, there you go, folks. 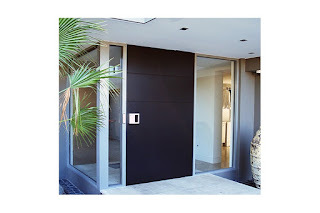 Ten large, pivoting doors that we believe deserve all the attention and admiration that we can bestow upon them. These doors have won our hearts. What about yours?